Earlier this week, the Chicago Transit Authority put into revenue service the first of 100 new sixty-foot articulated buses. 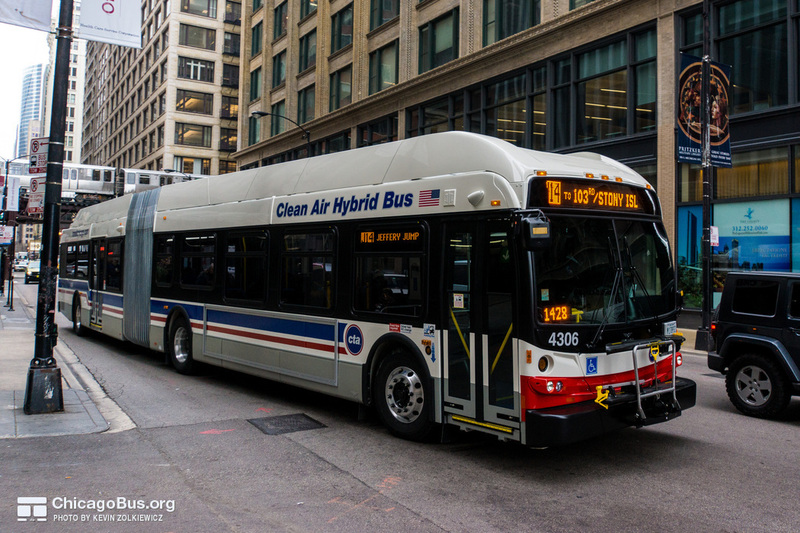 The $80 million purchase, approved by the Chicago Transit Board last May, contains a mix of 67 clean diesel and 33 hybrid diesel-electric buses from manufacture New Flyer of America, Inc. Bus #4306 at Monroe and Wabash, working route #J14 Jeffery Jump, on December 19, 2012. Primary differences from the existing fleet of articulated buses include a restyled front design and roof fins on the hybrid models. More Photos. The buses began to arrive at CTA’s South Shops maintenance facility in November. Late last week, they were moved to CTA’s 103rd garage and are currently serving primarily on the #6 Jackson Park Express and #J14 Jeffery Jump. The first buses to arrive are the hybrid versions, New Flyer’s model DE60LFR. Non-hybrid versions will be New Flyer’s model D60LFR. On the outside, the buses are aesthetically similar to CTA’s existing fleet of New Flyer DE60LF articulated buses with the exception of a restyled front design. In addition, the hybrid models feature roof fins to better conceal the roof-mounted equipment and provide a more streamlined appearance. The interior of the buses are nearly identical to CTA’s last order of articulated buses. One key exception is the seating arrangement. Rather than a longitudinal seating setup, the CTA has reverted to a more traditional transverse arrangement with nearly all seats facing towards the front of the bus. Delivery of the new buses is expected to continue into 2013 and will allow CTA’s fleet of articulated buses to expand to its largest number in the agency’s history. This will allow for use of the high capacity buses on a increasing number of routes. Separately, the CTA is expected to soon award contracts for the purchase of an additional 325 forty-foot clean diesel buses and 100 sixty-foot articulated buses, which will be a mix of hybrid and clean diesel. Manufactures New Flyer and Nova Bus are rumored as the front runners for receiving these contracts. The new bus purchases are in addition to the agency’s plans to perform a “gut rehab” of its expansive fleet of over 1,000 New Flyer D40LF forty-foot buses, which have begun to reach the midpoint of their 12-year service life. with the help of numerous contributors from Chicago Transit Forum. Copyright © 2003–2019 ChicagoBus.org. No affiliation with the Chicago Transit Authority.